Throughout this term, the topic of identity as projected through social media has come up multiple times, especially that of performed and constructed identities. The topic intrigues me. For the most part, I have observed minimal performance occurring in the posts of my Facebook friends except to small degrees. Performance that I have seen is usually just an extension of some identity they are already trying to project in real life, and so is not at all exclusive to the medium. Or, people may post only images that project having fun and being happy. But what other types of pictures would they show people if they were good old-fashioned sets of printed photographs? Do the posts of these individuals, whose personalities I know quite well, come across the same in their tweets? Do they project themselves differently on Twitter than on Facebook? Could the fact that I encountered their entire Twitter identity at once, rather than in bits and pieces over time, such as I have with their Facebook identities, affect any sense I might have of performance? I can’t really answer this last question, of course, but it was a factor I thought might be worth acknowledging. What found out in looking at the feeds of these eight friends and family members? Nothing too shocking. Their posts aligned pretty much perfectly with their personalities as I have known them for many years, and with what they say in real life. Some people were perhaps more restrained than they would be in person. I attribute this to the wider audience, or to the quasi-professional nature of a few friends’ feeds, which they use almost exclusively for networking and/or aggregation of information related to their profession. Of course, it is quite possible that some of these individuals may have other accounts, under pseudonyms, through which they have in fact constructed an online identity. I considered this while searching for their feeds, but decided that I should only take my cyber-stalking so far. 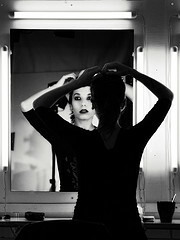 Photograph: “Getting Ready” by Giusi Barbiani. Use allowed under CC BY-NC2.0. Taken from https://www.flickr.com/photos/11590243@N05/5777362968/. Are tweets meant to be records? For me, considerations of social media always seem to come back to questions around its place in archives. One of the biggest concerns for archivists relating to social media is how exactly to go about acquiring and saving posts. There are issues of ownership, technological concerns, and questions around what else needs to be saved beyond the actual text of posts in order for them to have any value, such as comments and links. On some social media sites, however, people post not with the intention of creating something that they – or anyone else – will go back and look at in the future (or even the next few days for that matter). And now there is Snapchat, which brings this presumed ephemeral nature of Twitter into actuality. There are also scripts available that will automatically delete your tweets after a week (or whatever period of time that you designate). This leads me to wonder whether or not such posts should ever be considered to be part of a person or organization’s permanent record. They are often used as just a new form of conversation, after all, and we do not try to archive conversations. Archives have always collected letters, and one could make the argument that tweets are just a (very) new form of letter writing. Emails certainly are, but tweets are different. They are written in a differnt way and for different reasons. I guess the question I am getting at here is not so much about whether or not tweets could have historical value, but to what degree archivists should consider the intent behind their creation. If they were intended to be ephemeral, should they remain so? Of course, libraries and archives already explicitly collect ephemera (for example, the Bodleian Library’s printed ephemera collection with material dating back to 1508), so perhaps this is nothing new! In my last post, I talked about the challenges social media presents to archivists, questioning the place that social media “records” have in an archival collection. Now I would like to look at this issue of social media and archives from a different perspective. Instead of looking at how social media fits into archival collections, I will now consider how archives use social media themselves. I suspect that many archives jumped onto social media because of either internal or external pressure. Someone high up decided that the repository really should have a Facebook page or Twitter account, since everyone else has one. Or, the archivist themselves felt this same sentiment, based also on the fact that every other library, archives, museum, business, etc. is creating their own social media presence. There’s certainly nothing wrong with this, but I have seen in many of the archives or libraries that I follow on Facebook (my one and only social media account) a tendency to be posting in what seems like a haphazard manner. A sort of “we haven’t posted anything in a week and just need to get something up” attitude. Every institution is certainly not going to have the resources to put together a robust social media strategy. A post on the the popular (relatively speaking) blog ArchivesNext by archivist Kate Theimer sheds some interesting light on why connecting with users online is so vital, and might warrant taking some time away from “traditional” archival duties. The blog post in question is titled “The Future of Archives is Participatory: Archives as Platform, or A New Mission for Archives.” It was posted in 2014. In this post – which is actually the text of a talk that she had recently given – Theimer discusses the changing role of archives through the years. Up until the 1990’s, archives considered their role to be “collect, preserve and provide access to materials of lasting value.” Sounds fair enough. But, she notes that to simply provide access is purely passive: waiting for users to come to you. With changing expectations of how information (and anything, really) can be accessed, however, this attitude doesn’t work anymore. She notes the often thrown around concept that if it’s not online, it doesn’t exist, though she tweaks this sentiment to say that if it’s not online, researchers will work on something else. So, Theimer suggests a new mission statement for archives: “Archives add value to people’s lives by increasing their understanding and appreciation of the past.” She argues that this shifts the concept of providing access to a more active one, and that this revised way of viewing the role of archives puts people at the center rather than the material. She is talking not just about putting more material online, but actively informing people of the available archival material, trying to facilitate a sense of connection through stories and collection highlights, and finding ways to allow for participation by the public, through means such as allowing comments and tagging. I agree with Theimer in many ways, but I still struggle with the issue of what comes first: the archival records or the users of those records. More often than not, archives have a small staff, and a large backlog of material to process. To add outreach and social networking to the pile of work just takes away from that backlog. But, what good are archives if nobody uses them? I suppose the solution is simply to find the right way to strike a balance the two priorities of serving the people and serving the material (simple to state, much less simple to do, of course). If James Joyce had had a Twitter account, would literary scholars today be interested in them? Probably. But would they be valuable to scholarship, or just a source personal amusement? Going back to the question of ownership, a person can actually download the “archives” of their accounts from some social media platforms, including Facebook and Twitter. These downloads, however, completely strip away the activity of others (among other things), which means a loss of essential contextual information and, basically, the “social” and “network” aspects. Moreover, someone would have to think to download their social media archive while still living, and before they donated material to an archives or library. Quite frequently, it is only after a person has passed away that the donation happens. Access to an individuals social media accounts becomes rather tricky at this point. But the question around these issues that I find most compelling is simply whether or not social media even should be considered part of person’s archives and, if so, in what way and to what extent. This really gets at the issue of social media and identity. In what ways do we reveal our identity through social media? Are these true identities? If they are, in fact, actually performed identities to some degree (some people are more performative than others in their social media posts), would they still be valuable in the archival fond of a person? My opinion is that there is really no way to know right now. My reason: there are really no tried and true methods for assessing the archival value of any personal records, whether they are on paper, on a hard drive, or in the cloud. Archival theory is essentially based on institutional records, and the traditional ways of identifying archival value in institutional records (and therefore deciding what will be kept in the archives) do not translate all that well when dealing with personal archives (i.e., the records of an individual, family, or possible a small community). I won’t go into much detail about this here,** except to say that if we are still trying to figure out how to appraise personal archives generally, and also still trying to figure out how to manage digital archives generally, questions around the value of and strategies for managing all of these cloud-based social media records are a long way from being answered. * You can read more about the Library of Congress’ Twitter archive and the challenges that they are facing in managing it in LOC’s report “Update on the Twitter Archive At the Library of Congress,” available here. I have one social media account: Facebook. I reluctantly made this account five years ago after moving across the country, as a way to stay in touch with folks back home. Since then, I have posted a grand total of three status updates and 16 photographs. I login once a week or so, sometimes more if I’m looking for a source of procrastination. Because of this, I often find myself afflicted with what I call “Facebook guilt” : I didn’t like enough photographs. I missed my former classmate’s birthday. I failed to comment on a friend’s update about a new job within three hours of them posting. The guilt usually passes pretty quickly though. I find out about the things that matter most in other ways. I’m by no means against social media; it just isn’t my thing. I do think it can be overused, but I also think it can have value. And I’ve finally admitted to myself that it is not going away and that, if for nothing else than professional reasons, I should probably become more versed in how to use it, which is why I am taking this class. I do have a small amount of experience managing the Facebook account of an organization, the nonprofit where I worked for many years prior to coming to SLAIS. Like many other organizations, we realized that we needed to jump on the social media bandwagon and so started a Facebook page, without much of a strategy in place beyond post regularly and get as many followers as possible. And this is what I did. Even at the time, I knew we could be using social media more to our advantage, but did know how. Like many other organizations, especially smaller nonprofits, we simply did not have the staff time to devote to developing a social media strategy that fully integrated with our overall communications. As for the world of social media beyond Facebook, I have never been anything more than an occasional spectator. I read a few blogs related to archives, libraries, and other areas of personal interest to me. I’ve never taken the time to use any sort of feed aggregation tool, mostly because I feel like if I did do that, I would end up with too may feeds and just end up scrolling through entirely too many titles. kathryn ferrante on Are tweets meant to be records? fionahan on Are tweets meant to be records?